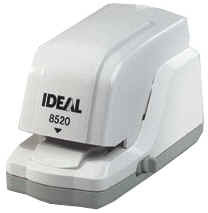 The Ideal 8520 provides you with comfortable, quick and effortless stapling. It is perfect in offices, large and small, by copiers and mailrooms. HNEWs up to 5000 staples without reloading. Effortless stapling of up to 20 sheets at a time. Patented flat stapling system. Virtually silent operation.